Founded in 1883, The Vermont Cynic’s mission is to serve the University of Vermont and the Burlington community as an independent student voice that strives to be an outlet for valuable information and to promote the exchange of ideas. We serve those in our organization by working collaboratively and respectfully with one another, by collectively learning skills necessary to promote fact-based and enlightening discourse and by learning to be more effective members of a democratic society. The Cynic hopes to stimulate social growth through fair reporting, dedication to fact and integrity and asking hard questions. This organization is editorially independent from the University of Vermont and exists as a student-managed public forum. We exercise to the fullest extent every press freedom available to us. 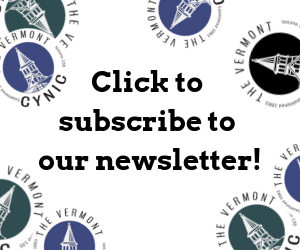 The Vermont Cynic is published on Wednesdays from September through May, excluding school breaks and exam periods. We covers news and events relevant to campus and the Burlington community. Space is also provided for letters to the editor and op-eds written by members of the University of Vermont community. Though the Cynic is listed alongside other student organizations, the paper is unique in that the paper is funded primarily through advertising, subscriptions and online contributions. If you read the Cynic regularly but do not hold a subscription, please consider making a contribution to support our continued publication. Editorships at the Cynic turn over in November. The incoming editor-in-chief selects the managing editor and operations manager. Applications for section editor positions are due toward the end of the fall semester. Staff must have been with the Cynic for at least one year prior to applying for a section editor position. If you are a University of Vermont student you are eligible to join the Cynic as a member of the editorial or business staff. Prospective members may apply to the Vermont Cynic by filling out an application and are always welcome at our weekly staff meetings, held on Wednesdays. There are always opportunities for students looking to get involved. No prior experience with newspapers is expected or required. Students begin as corresponding writers and photographers, and are promoted to staff after completing three assignments. Students who have completed 13 assignments are promoted to senior members. In this position they are expected to write or shoot for the Cynic on a regular basis and take on challenging assignments.